Saw the birth of a new idea sponsored by the F.A.I. It was the introduction of promotion and relegation between the F.A.I. and a new 1st Division League. This First Division League was composed of ten clubs including Bray Wanderers. The other clubs were Longford Town, Drogheda, Finn Harps, Sligo Rovers, Derry City, Cobh Ramblers, Emfa (K ilkenny), Newcastle Utd., and Monaghan Utd. The first four teams had been relegated from F.A.I. Premier League. 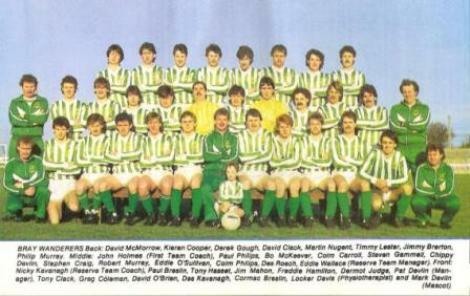 Senior football returned to Bray in 1985 after an absence of 42 years when Wanderers hosted Dundalk in a League cup group 3 game on 8th September 1985. 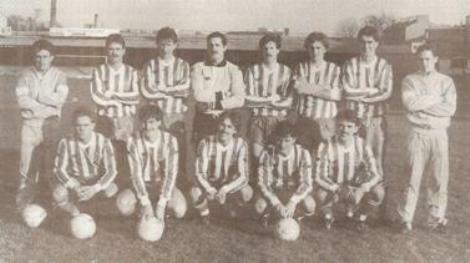 Manager Pat Devlin had assembled a squad of players mostly from the Leinster Senior league along with a few players with previous League of Ireland experience. Wanderers earned a deserved 1-1 draw with Dundalk and followed up that point with three 1-0 wins away & home over the league champions Shamrock Rovers and at home to Drogheda. Wanderers reached the quarter final only to lose 1-0 at home to Home Farm. 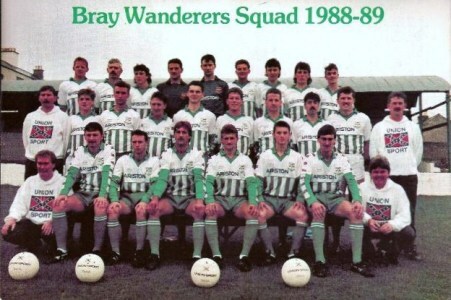 The reality of life in the League of Ireland Premier division was quickly brought to the attention of Bray Wanderers in their opening League cup match of the 1986/87 season when they were hammered 5-0 by Waterford United at kilcohan Park. Two subsequent draws with First division opposition Cobh Ramblers (2-2, home) and Finn Harps (0-0, away) did not suggest a good season ahead. However Wanderers turned things around and won their final three group games to top the section. Strangle Wanderers faced Waterford again in the quarter final at Kilcohan and were beaten 1-0. Cormac Breslin headed Wanderers first ever goal in the premier division in the final minute of Wanderers opening game against Cork City at the Carlisle grounds to secure a 1-0 win. Bray picked up only two points from their next six games and were just above the drop zone before they defeated Sligo Rovers 2-1 in December at the Carlisle Grounds. Wanderers really hit form in January 1987 when they won four and drew one game in a five match unbeaten run to take them up to mid-table. However only one point was picked up from four games in February and early March to leave Wanderers fighting a relegation battle. With only three games remaining Wanderers travelled to the Showgrounds in Sligo and fell behind to John Burke�s 34th minute header. Sligo were defending a ten game unbeaten run and only Chippy Devlin in the Bray goal prevented them from adding to their total. Bray made a late rally and Joe Lawless was on hand four minutes from time to head home a Martin Nugent cross. The point earned guaranteed Wanderers survival in the premier division that season. Bohemians ended Wanderers interest in the FAI cup with a 1-0 win at Dalymount Park in round 2. Wanderers had struggled to defeat EMFA (Kilkenny) in the first round after a replay at the Carlisle Grounds. Wanderers reached the semi-final of the Leinster senior cup only to lose to St. Patrick�s Athletic. Their best performance came in the quarter final when they defeated the league champions Shamrock Rovers 3-0 after extra time. 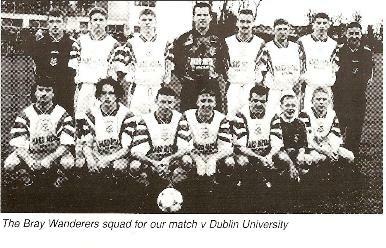 Wanderers started the 1987/88 season by reaching the semi-final of the Leinster senior cup which included a 4-3 home win over Bohemians in the quarter final. The league cup ended with a 0-2 home defeat to St. Patrick�s Athletic when only a draw was required to progress to the knock out stages. The premier division league campaign got off to a slow start with Wanderers failing to win any of their opening eight matches before defeating St. Pat�s 1-0 at Richmond Park on November 1st. That win failed to inspire the team who then suffered five consecutive defeats. Eighteen year old midfielder Eddie Gormley was sold to Tottenham Hotspur in mid-November for a club record fee to help alleviate the clubs poor financial situation at the time. 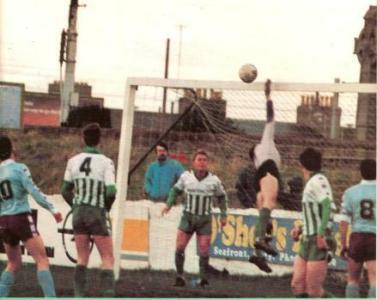 Bray had dropped into the relegation zone by Christmas and Manager Pat Devlin decided to resume his playing career on St. Patrick�s Day 1988 and helped the team to its biggest win of the season, a 3-0 victory over Sligo Rovers at the Carlisle grounds. With three games to go Wanderers earned a well deserved 1-1 draw with St. Pat�s in Richmond Park to dent the Inchicore club�s hopes of the premier division title. Pat Devlin scored his only goal that Easter Good Friday and was later sent off by referee Ollie Cooney for hitting an opponent. Wanderers failed to avoid the drop at the end of the season. Dundalk knocked Wanderers out of the FAI cup in the third round at Oriel Park winning 2-0. Wanderers had earlier defeated EMFA (Kilkenny) after a replay in round 2 with goalkeeper Christy Devlin scoring twice from the penalty spot in a 3-0 win at Buckley Park. After suffering relegation to the First division there was quite a considerable change to the Wanderers first team squad for the 1988/89 season. New signings included Josh Moran, Mick Doohan, Alan Smyth, Brian Cosgrave, Kevin Reynolds, John Finnegan and Richie Parsons while John Ryan arrived on loan from St. Patrick�s Athletic in October. Bray started the season by reaching the Leinster Senior cup semi final after defeating Drogheda United (3-0) and Shamrock Rovers (1-1) on penalties to set up a semi final appearance against Dundalk. The league cup campaign ended in the final group game as Home Farm defeated Wanderers 4-1 at Tolka Park after earlier defeating St. Pat�s (1-0) at Richmond Park. The League campaign started very slowly with only one win recorded from the opening five games. Wanderers then went nine games undefeated before losing twice in four days in mid December to Longford Town and Home Farm. John Ryan scored twice as Wanderers defeated Dundalk in the Leinster cup semi final to reach the final for the first time in the clubs history. Bohemians provided the opposition before a large crowd in the final at Tolka Park. Normal time failed to produce a goal and Dermot Judge looked to have sealed a famous cup win for Bray by scoring late in extra time. Jackie Jameson scored an equaliser with the last kick of the game to force a replay. In the FAI cup Wanderers defeated premier division Waterford United 1-0 after a replay in round 2 before ending Finn Harps hopes in the third round after a marathon three games. Eugene Davis was again the hero scoring the winner at Finn Park as he had done in the previous round against Waterford. In the quarter final replay against Drogheda United Alan Smyth scored the only goal at United Park as Wanderers reached the semi final for the first time ever. The 1988/89 FAI cup was the only time that the semi finals were played over two legs. Wanderers brought almost 2,000 fans to Turners Cross in Cork and recorded a 1-0 win with Eugene Davis hitting his fourth FAI cup goal of the season. Cork won the second leg 1-0 at the Carlisle Grounds and also the replay 4-0 at Turners Cross to end Wanderers hopes. Having played 10 FAI cup matches in two months Wanderers faced a backlog of league fixtures and needed to beat Monaghan United in their final game at Gortakeegan to secure the runners-up position to Drogheda United. Wanderers were held to a 1-1 draw and lost out on promotion to UCD on goal difference. The Leinster senior cup final replay was postponed until the start of the following season due to Wanderers fixtures congestion Josh Moran was senior player of the year while John Finnegan took the B team award. Wanderers� first game of the new season was the re-arranged Leinster Senior cup final against Bohemians which was carried over from the previous season due to fixture conjestion. Derek Swan scored the only goal as Bohemians won 1-0 at the Carlisle Grounds. Two days later Bray were back competing in the new season�s Leinster cup and reached the final again with victories over TEK United, Shelbourne & Drogheda United. St. Pat�s defeated Wanderers 2-0 in the final at Dalymount Park in November. The league cup campaign ended with a 5-1 defeat at Dalymount Park against Bohemians. Wanderers began the league campaign with five wins from their opening six games to set the early pace. The promotion raced turned into a four team race with Waterford United, Kilkenny City & Sligo Rovers along with Wanderers attempting to gain one of the two promotion spots. On the final scheduled day Bray visited Waterford United while Sligo Rovers hosted Kilkenny City. Bray lost 2-1 while Sligo and Kilkenny drew 1-1 to leave Sligo & Waterford tied on 37 points apiece, 2 ahead of both Bray & Kilkenny. The league championship was not decided on goal difference then and Waterford beat Sligo 2-1 on aggregate to win the title on a play off. First division clubs were at a disadvantage when it came to the FAI cup for 1990 as their season was completed while the premier division still had a few series of games remaining. Bray defeated non-league Rockmount 3-0 at the Carlisle Grounds in round 2. Wanderers then drew 1-1 away to Shelbourne in round 3 after completely dominating the game. Shels only equalised with a late controversial penalty. The replay ended scoreless, but Wanderers advanced 4-1 on penalties in the first ever FAI cup tie to be decided on penalty kicks. John Ryan scored the only goal in a 1-0 quarter final victory over Galway United at the Carlisle Grounds. FAI cup semi final team. Two of the biggest shocks ever in the history of the FAI cup took place on Sunday 22nd April 1990. Bray Wanderers 2 Derry City 1 & Bohemians 0 St. Francis 1. Two premier division clubs defeated by a First division and a non-league team to set up a fairytale cup final on Sunday 13th May. John Ryan became only the second player ever to score a hat-trick in the FAI cup final as Wanderers defeated St. Francis 3-0 in the first ever final to be played at Lansdowne Road. 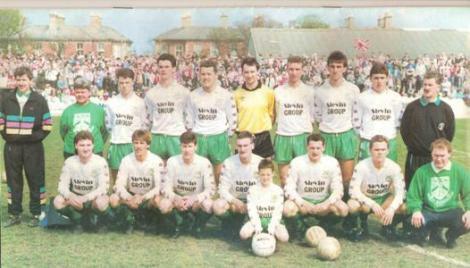 FAI Cup winning team 1990: Josh Moran, Anthony McKeever, Brian Cosgrave, Mick Doohan, Dermot Judge (capt), Colm Phillips, Martin Nugent, Kevin Reynolds, John Ryan, Tommy McDermott, John Finnegan. Subs: Derek Corcorcan for Finnegan (87 mins), David Kealy for McDermott (87 mins). Squad: Richie Parsons, Adrian Cairns, Colm O�Snodaigh, Alan Smyth, Derek Gough, Andy Lynch. Dundalk defeated Bray 3-1 in the President�s cup final at the Carlisle Grounds in April. John Ryan was player of the year while Colm � Snodaigh was the B team player of the year. 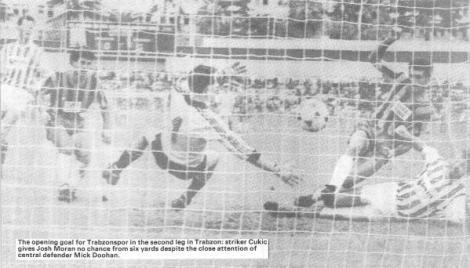 Bray Wanderers first venture into European club football saw them paired with Turkish club Trabzonspor. The first leg of the European cup winners cup preliminary round was pl;ayed at tolka Park where Wanderers found themselves a goal down after only two minutes of play. However Wanderers produced a vmuch improved second half and were rewarded with an equaliser from Martin Nugent to earn a very creditable 1-1 draw. The result was marred by the facf that two Wanderers players Clem McAuley & Derek Corcorcan both suffered broken legs in the match. In the second leg Wanderers were beaten 2-0 to lose the tie 3-1 on aggregate. Wanderers failed to progress beyond the group stages of either the league cup or Shield competitions. In the First division Drogheda United set the pace from the beginning and remained in pole position all season. The crucial result of the season proved to be a 2-0 defeat away to Drogheda in January which more or less guaranteed that Drogheda would be promoted as champions. Manager Pat Devlin departed just before Christmas to link up with Noel King at Shamrock Rovers by becoming their Technical Director. John Holmes stepped up to become Wanderers manager. Non-league Midleton pulled off the shock of the first round of the FAI cup by dumping out the holders Bray Wanderers 2-0 in Midleton. These were the only defeats suffered by John Holmes in his first twelve games. Four successive league wins in late March and early April set Wanderers up to clinch the runners-up position in the First division and promotion to the premier division. John Holmes's first full season in charge of Bray Wanderers began with elimination from the league cup in the group stages with two draws and one defeat. The Leinster senior cup campaign ended in round 2 by a 3-0 defeat away to Drogheda United. After three premier division matches Wanderers were joint top with two wins and a draw from their opening three games. From that point on in mid September to the end of December goalscoring proved to be a big problem for the team with new signing full back Stephen O�Reilly from Kilkenny City leading the way. In a run of 16 games Stephen scored three times while only Mick Doohan from the penalty spot and two own goals contributed to a total of six goals scored. Despite the lack of goals Wanderers remained just outside the relegation places on account of four wins. The relegation battle went to the final week of the season. With only three games remaining Wanderers were only a single point clear of the bottom three clubs and two points behind Drogheda United but with a crucial game in hand. All five clubs drew their third last match 1-1. Wanderers then pulled off a major shock by defeating Cork City 2-1 at the Carlisle Grounds in mid-week in their game in hand to severely dent Cork�s hopes of qualifying for the UEFA cup. On the final day of the season any of five clubs could have finished in the two relegation places. Wanderers defeated Bohemians 1-0 at the Carlisle Grounds with a goal from �Bo� McKeever to secure premier division survival by finishing in 8th place to equal their highest premier division finishing position ever. Pat Devlin�s Athlone Town were defeated 6-3 by St. Patrick�s Athletic at Harolds Cross and thus were relegated along with Galway United. Wanderers did reach the quarter final�s of the FAI cup by defeating Ashtown Villa (2-1) & Galway United (1-0) at the Carlisle Grounds before losing to St. Patrick�s Athletic 1-0 at Harolds Cross. 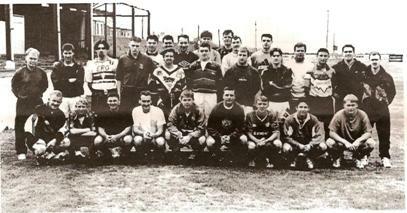 The League of Ireland introduced a new system in the premier division for season 1992/93 similar to that which was operating in Scotland at the time by splitting the league into two sections after each club had played each other twice. The top six teams were left to contest the Premier division title while the bottom six were involved in the relegation struggle. In the Leinster senior cup Bray defeated TEK United 4-1 in round 1 before facing St. Francis for the first time since the 1990 FAI cup final in round 2 at Baldonnel. Bray lost on a penalty shoot out after a scoreless draw. In the League cup Bray beat Home Farm 3-1and drew 0-0 with Shamrock Rovers at home to set up a group decider away to St. Patrick�s Athletic. In probably their best performance of the season Bray put up a good show and were unlucky to lose 2-1. In the league Bray struggled from the beginning, and like the previous season they found goal scoring to be their major downfall. Wanderers remained in the bottom two almost all season and managed only one win from their opening 21 league games. 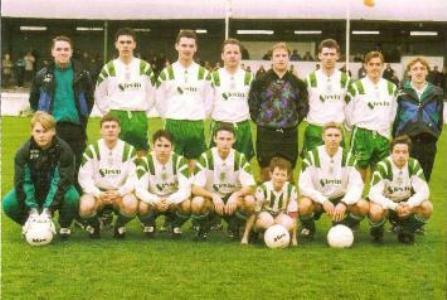 A 2-1 win with both goals from Jason Byrne (ex-St.Pat�s) in the final game before the split away to Waterford United was followed a week later by a 1-0 win over Drogheda United in the Carlisle Grounds only proved to be a false sense of hope as six games without a win followed. Wanderers did win two of their final three games but at that stage their hopes of survival in the Premier division were well diminished. From 32 league games in total Wanderers failed to score in 16 of those games and only managed to score more that once on three occasions. Wanderers were drawn at home to high flying Shelbourne in the FAI cup and managed to hold their visitors to a scoreless draw. Shelbourne won the replay 4-1 and went on to beat Dundalk in the FAI cup final later that year. Gavin Teehan was the senior team player of the year while Pat O�Brien won the B team award. For the third successive season Bray Wanderers struggled to find the back of their opponents net, particularly in league games .where only 17 goals were scored in 27 league games. The season started brightly by defeating Shamrock Rovers in the Leinster cup on a penalty shoot out. 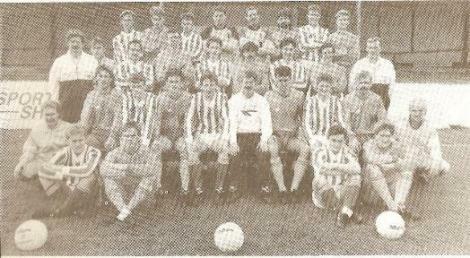 This was followed by two impressive 3-1 away wins over UCD (after extra time) and Shamrock Rovers in the League cup. St. Patrick�s Athletic ended Bray�s campaign in the quarter final with a 1-0 win at Harold�s Cross. The Shield campaign failed to provide a single goal in four games, two 1-0 defeats and two scoreless draws left Wanderers bottom of their section. Wanderers struggled in the league from the beginning and won only one of their opening ten league games. During that spell they played six consecutive draws, five of them finishing 1-1. 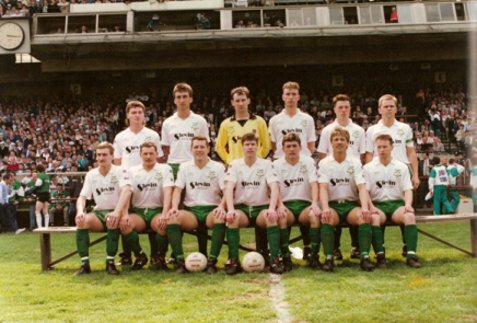 In March 1994 Wanderers played four successive scoreless draws in a spell of 7 league games without a goal. This was Wanderers worst run ever of games without a goal. 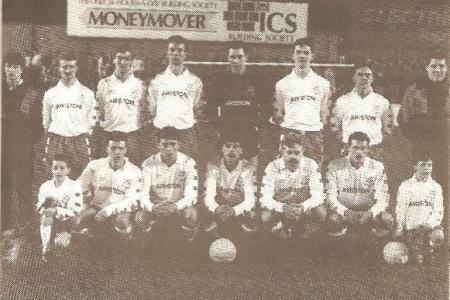 From January 1994 to March 1994 Bray scored only one league goal in ten league games. Wanderers were forced to apply for re-election to the League of Ireland for the only time in the clubs history after finishing the league campaign in ninth place in the First division. In the FAI cup non league Cherry Orchard held Wanderers to a 1-1 draw in the Carlisle Grounds. Maurice Farrell scored his first goal for the club that afternoon. Derek Smyth scored twice in the replay as Wanderers advanced 2-1 after extra time. Bray took a shock lead in the third round against Derry City at the Brandywell with Philip Gormley scoring but the premier division side turned things around and scored twice in first half injury time Derry added a third in the second half to win 3-1. Defender, Adrian Cairns was voted the supporters club player of the year for the season. Martin Lawlor was the B team player of the year. After two seasons where only 57 goals were scored in 79 games Bray�s goal scoring fortunes took a turn for the better as Philip Gormley and new signing from Wayside Celtic Colm Talbot formed a good strike partnership for the season. Bray�s league cup campaign ended in the group stages, but not before John Holmes� youthful team put up excellent displays in defeats against premier division sides Shamrock Rovers and St. Patrick�s Athletic. The Shield campaign also ended in the group stages. After defeating Longford Town 3-0 away in their opening game Wanderers lost their final three games in the Northern section. Philip Gormley was in tremendous form hitting five goals in seven league and shield games at the start of the season. In the league Wanderers were in mid table up to the end of the year before a bad run of results sent them tumbling down the table. Six defeats from eight league games from the end of December to the middle of February saw Wanderers drop to one place above the re-election zone. During that bad spell Wanderers suffered a shock FAI cup defeat away to Cork non league side College Corthintians, losing 1-0. Manager John Holmes re-signed at the beginning of March but went out on a high as Wanderers defeated St. James�s Gate 3-0 at the Iveagh Grounds. Kieran O�Brien scored twice that night, his first goals for the senior team. Pat Devlin returned for his second spell in charge of the club and used the final five games of the season to give the full squad a game. Wanderers drew four in a row and lost their final game of the season away to Home Farm on Pat�s return but were well safe from the re-election zone. Gavin Teehan was the Supporters Club player of the year. Gavin became the first player to win the player of the year award twice. Kieran O�Brien was the B team player of the year. Wanderers began this campaign by reaching the semi-final of the league cup for the first time in the club�s history. Wanderers topped their group after beating Bohemians & Home Farm and drawing with Shelbourne. In the quarter final Wanderers came from two goals down to draw with Dundalk at the Carlisle Grounds with two late goals from Kieran O�Brien. Wanderers advanced to the semi finals after a penalty shoot out. Shelbourne defeated Wanderers 2-0 in the semi final at the Carlisle Grounds. In the Shield Wanderers reached the final after winning their opening three group games. In the final Wanderers trailed Waterford United 3-0 after the first leg at the RSC. In the return leg Philip Gormley scored twice from the penalty spot in the opening half and Richie Parsons added a third after the break to force a penalty shoot out. Goalkeeper Pat Trehy was Wanderers hero in the shoot out as Wanderers lifted the trophy for the only time in their history. New signing Graham Coughlan from Cherry Orchard was so impressive in the League cup and Shield competition that he was signed by English Premiership side Blackburn Rovers. Graham is now playing with Plymouth in the English Championship. In the league Wanderers hammered Monaghan United 5-1 at Gortakeegan on the opening night with Richie Parsons scoring the very first league hat trick for a Bray Wanderers player in the National League. After that they remained on top of the table all season and remained unbeaten until the 14th series of matches when they were defeated 2-0 away to St. James�s Gate. After that initial defeat Wanderers won five out of their next six games and clinched the title with a 1-1 draw at home to Limerick with four games remaining. Wanderers FAI cup campaign ended in a disastrous 4-0 home defeat to non league Fanad United while their Leinster senior cup campaign also ended in a home defeat to another non league side Vianney Boys. Robbie Coyle was the Supporters club player of the year while goalkeeper Colin Kelly picked up the B team award. Bray began the season by qualifying from their group in the league cup with 2-1 wins over St. Patrick�s Athletic & UCD. Sligo Rovers defeated Wanderers 1-0 in the quarter final at the Carlisle Grounds. Ashtownvilla knocked Wanderers out of the Leinster senior cup in the second round with a 1-0 win in Bray. In the First division Bray Wanderers and Waterford United contested the title from the beginning. Bray had a great start to their campaign winning 3-0 away to Waterford and followed that win with three successive victories to set the early pace. In October Wanderers defeated Cobh Ramblers 7-0 at the Carlisle Grounds to record their biggest ever winning margin in the National League. Bray suffered a couple of league defeats while Waterford United went on a fourteen game unbeaten run, winning eleven of them to lead the table by five points after 15 games played. The Shield competition was played in January after two series of games in the First division had been completed. Bray failed to advance from their group despite winning two of their four group games. Finn Harps defeated Wanderers 2-0 in the second round of the FAI cup in Ballybofey in January. When the First division campaign resumed in late February Bray had narrowed the gap to only two points and defeated Waterford 3-1 in the RSC to go top of the table. However, Bray lost all three of their league games in the month of March to let Waterford back to the top of the table. Waterford clinched the title with three games remaining while Wanderers finally secured the runners up spot when Jody Lynch scored a late winner against Monaghan United at the Carlisle Grounds in Bray�s penultimate game. Jody Lynch was the Supporters Club player of the year while Darren Power picked up the B- team award and Aodhan O�Donoghue received the under 21 player of the year award. Athlone Town defeated Wanderers 2-1 in the Leinster Senior cup at the Carlisle Grounds in November. In the league Wanderers got off to their best start to a premier division campaign ever and were third in the table after series five with three wins and two defeats which included away wins for the very first time in the league against Shamrock Rovers and Bohemians. Bray remained third after hammering Waterford United 6-0 at the Carlisle grounds in October to record their biggest premier division win ever. Wanderers then lost eight successive league games (a club record) to drop to bottom of the table by Christmas. Mick Doohan rejoined the club from Dundalk in December to enhance the defence. In January John Walsh kept six successive clean sheets, also a club record. By April Wanderers had moved up to ninth position but then suffered two home defeats to Waterford United and Sligo Rovers to drop back into the relegation zone. Going into the final game of the season Wanderers still had a mathematical chance of avoiding the drop but were beaten 1-0 away to St. Patrick�s Athletic on the day that Eddie Gormley captained the Saints to the premier division title. In the FAI cup Bray defeated St. Francis (5-0) and Cherry Orchard (3-0) both at the Carlisle Grounds before meeting Sligo Rovers in the quarter final. In a three game marathon, Bray drew 1-1 away & 0-0 at home before winning the third game 1-0 with a Colm Tresson penalty at the Carlisle Grounds. Bray then defeated the holders Shelbourne 2-1 in the semi final at Tolka Park to set up a final appearance against Finn Harps. After an uneventful first game which ended 0-0 the replay proved to be a much more entertaining contest. Wanderers equalised twice in the dying minutes of normal time and extra time through Barry O�Connor (87 mins) & Kieran O�Brien (120 mins) to earn a replay. In the third game Bray fell behind to Jonathan Speak�s goal on 12 minutes. Wanderers replied with two goals from Jason Byrne on 38 minutes & 73 minutes to lift the cup for the second time in their history. Colm Tresson was voted the supporters club player of the year while Justin Dutton picked up the B team player of the year award. Bray had an early start to the season having to compete in the FAI Super cup at the beginning of July for League clubs that qualified for European competitions. Bray lost away to Shelbourne before beating Cork away in their two games in the competition. In the UEFA cup Bray were defeated 4-0 away & home to Swiss club Grasshoppers Zurich. Bray qualified for the semi finals of the league cup for only the second time in the club�s history after defeating Kilkenny City, UCD & Shamrock Rovers all at the Carlisle Grounds. Derry beat Bray 2-1 in the semi final at the Brandywell. Wanderers started their league campaign well and were top of the table during the month of September. However three league defeats at home to Dundalk & away to Kilkenny City & Cobh Ramblers saw Wanderers drop to third place by mid November. Six wins and a draw from the next seven games put Bray back on top of the First division in the first week of the New Year. Despite suffering another home defeat to Dundalk and away to Kilkenny in March Bray still retained the top spot going into the final game of the season. A win at home to Limerick in the final league game of the season was all that Bray required to lift the First division title. Colm Tresson put Wanderers ahead but Limerick equalised on the stroke of half time. With Longford winning in Cobh at the same time Bray needed to win to be assured of the title. With only seven minutes remaining on the clock Barry O�Connor headed home Ciaran Ryan�s cross to seal a 2-1 win and the title. In the FAI cup Bray advanced to the semi final by defeating Derry City (2-1 at home after 1-1 away draw), Fairview Rangers (2-0 away) & Kilkenny City (2-0 away). In a controversial semi final Bohemians ended Bray�s hold on the trophy with a 2-1 win at Dalymount Park. Bray also lost in the semi final of the Leinster senior cup to St. Patrick�s Athletic at the Carlisle Grounds, their third semi final cup defeat of the season. Colm Tresson was the Supporters Club player of the year for the second consecutive season while Cormac Begley was the B team player of the year. Bray had an early start to the season, having to compete in the FAI Super cup, at the beginning of July for League clubs that qualified for European competitions. Bray lost away to Shelbourne before beating Cork City away in their two games in the competition. Wanderers qualified for the semi finals of the league cup for only the second time in the club�s history after defeating Kilkenny City, UCD and Shamrock Rovers, all at the Carlisle Grounds. Derry beat Bray 2-1 in the semi final at the Brandywell. Wanderers started their league campaign well and were top of the table during the month of September. However, three league defeats at home to Dundalk and away to Kilkenny City and Cobh Ramblers saw Wanderers drop to third place by mid November. Six wins and a draw from the next seven games put Bray back on top of the First division, in the first week of the New Year. Despite suffering another home defeat to Dundalk and away to Kilkenny City in March Bray still retained the top spot going into the final game of the season. A win at home to Limerick in the final league game of the season was all that Wanderers required to lift the First division title. Colm Tresson put Wanderers ahead but Limerick equalised on the stroke of half time. With Longford winning in Cobh at the same time Bray needed to win to be assured of the title. With only seven minutes remaining on the clock Barry O�Connor headed home Ciaran Ryan�s cross to seal a 2-1 win and the title. In the FAI cup Bray advanced to the semi final by defeating Derry City (2-1 at home after a 1-1 away draw), Fairview Rangers (2-0 away) & Kilkenny City (2-0 away). In a controversial semi final Bohemians ended Bray�s hold on the trophy with a 2-1 win at Dalymount Park. Bray also lost in the semi final of the Leinster senior cup to St. Patrick�s Athletic at the Carlisle Grounds, their third semi final cup defeat of the season.